ST. MELLA, ABBESS OF DOIRE-MELLE, COUNTY OF LEITRIM. Some account of this holy woman is given by Colgan and by the Bollandists. St. Mella flourished, about the middle of the eighth century, in the northern parts of the Connaught province. This, has been inferred, from the circumstance of her son St. Tighernach's death, having been recorded, at a.d. 805. The devout matron, by God's holy decree, was the happy mother of two sons, whose names are found on record, in the pages of our Irish Martyrologies. These are named respectively, St. Cannech, a Priest, and St. Tigernach, an Abbot. Having been deprived of her husband, by death, she afterwards formed the resolution of embracing a religious life. St. Tigernach erected a religious house, near Lough Melve, —now known as Lough Melvin,—in the county of Leitrim, and within the diocese of Killmore. He left this establishment, in favour of his mother; and, he then retired to another monastery, named Kill-Acaidh, or "the church of the field," the situation of which is unknown. St. Mella presided over a community of holy women, at the former place which, from her, took the name of Doire-Melle, which signifies, the "oak grove of Mella." We are told, it had been situated in Rossinver parish, county of Leitrim, although the name is not known, at present. It is said, she ruled over her nunnery for many years; but, little more has transpired respecting her. She is supposed to have died, before the year 787, as her name occurs, in the Martyrology of Tallagh. In it we find inserted, Mella, at the 9th, and Doire Mella, added, at the 31st of March, to the same etymon. In the Martyrologies of Marianus O'Gorman, and of Cathald Maguire, there is a Mella, belonging to the church of Cluainai, set-down, for the 19th of March. But, she may have been a distinct person. The Martyrology of Donegal gives her this title of Doire Mella, on the 31st of January, when alluding to her son Cainneach; but, at the present day, it has no record of her feast. By her influence and authority, St. Mella awakened in the souls of her religious, as of her own two sons, the love and fear of God. This she effected, likewise, in the spirit of gentleness, forbearance, and true charity. That the present pious servant of Christ was a useful worker, in his Master's vineyard, can hardly be doubted. Colgan has collected some particulars, with a view to supply his Acts, at the present date. The Bollandists merely notice him, also, as Tola, Bishop of Disert Tola, surnamed The Devout. His Acts had escaped the researches of Colgan; and, hence, very few circumstances, concerning his life, are recorded. However, that writer had no doubt, the Acts of our saint were extant, in his time, although he had been unable to procure them. For, not only his festival day, but his race, the places in which he had been venerated, and the year of his death, had been recorded, by our early Martyrologists and Annalists. The father of this saint was named Dunchad. He was son to Ernin, son of Garuan, according to the Psalter and Calendar of Cashel. The latter even more fully traces his family line. The pedigree of St. Tola is drawn from the race of Kien, son to Olild Olum, and he descended from the illustrious Galengi family. This tribe, according to the supposition of Dr. Lanigan, inhabited some of those districts known as Galenga, or Gallen. There was a Gallen, or Galien, which comprised a great part of Carlow and Kildare counties, with some of the Queen's County. As the situation of that place, where our saint commenced his career, was not far removed from this latter district, according to the same authority, it is not improbable, Tola had his birth within that territory. It is likely enough, that he was born, after the middle of the seventh century. For many years, our saint led the life of a hermit, at a place called Disert Tola, or Tola's Desert. According to the Calendar of Cashel, that place was situated in Meath; but, other authorities place it within the Dalcassian territory, in the northern part of Munster. It was supposed to have been, in Dealbhna, or Delvin, and situated in the present Garrycastle barony. King's County. The true site, however, is said to have been at Dysart Taula, in the parish of Killoolagh, barony of Delvin, in the county of Westmeath. At this place, he lived an eremitical life, for some years; and, according to one account, he built a monastery, in the eighth century. Such was the fame of his sanctity, that many disciples were attracted thither; and, over these, he exercised the rule of Abbot. The site of this old church is still pointed out, but its walls have been uprooted. Afterwards, St. Tola was assumed to a higher dignity, having been called upon to preside over Clonard see, in Meath. Colgan doubts not, but that his name had been venerated in Clonard church, over which he presided, although no mention of this circumstance occurs, as he states, in our Irish records. Although, perhaps, a contemporary with Tola, Bishop of Ardbraccan, in Meath, who died a.d. 760, our saint was a different person. He also lived at a time, posterior to that, when flourished Tolua, or Toluan, Abbot of Clonmacnoise, in Meath, who died in the year 609. The death of our saint must be placed, at an intermediate period, to both these dates. The faithful servant of Christ departed this life, during 733, in the fourth year of the reign of Aidus, who was son to Fergal, and King over Ireland. The Annals of Ulster place his death, at A.D. 737… his memory was revered, at Disert Tola, on the 30th of March—the assumed date for his death. According to no less than six different Martyrologies, this account has been given. Besides St. Mochua of Balla, the Feilire of Aengus commemorates St. Colman of Land Ligach, and St. Tola, at the 30th of March. The Martyrology of Tallagh enters the name, Tola; and Bishop of Craibdigh follows this designation, at the 30th of March. The Calendar of Cashel, and Marianus O'Gorman commemorate him. The Irish Genealogist, Duald Mac Firbis, enters Tola, bishop, from Disart Tola — said now to be Dysart O'Dea, county of Clare in Upper Dal-Cais, at March the 30th. Again, on this day, the Martyrology of Donegal registers. Tola, Bishop, of Disert Tola, in the upper part of Dal Cais, in Thomond. In Scotland, also, he was commemorated. Thus, the Kalendar of Drummond states, at March 30th, or iii. Kalends of April: In Hibernia, the Holy Confessors Mochua, Colman, and Tola, went to Christ. There was a St. Teloc, a disciple of St. Patrick. Colgan thinks it possible to identify him, either with the present St. Tola, or with Telleus of Tehelly, venerated the 25th of June. But, the chronology cannot accord for the present holy man. A miracle, which took place, in the year 1034, is ascribed to the merits of St. Tola. Coirten Ua Maebuain, Lord of Dealbhna, was killed by some of his clansmen, on the threshold of Disert Tola church. In punishment for this sacrilegious and unnatural murder, the perpetrator of the crime was massacred, within that very same hour he perpetrated the treacherous act. A very brief allusion to St. Lassara occurs, in the Bollandists' Collection, at the 29th of March. Entering more into particulars, Colgan notices her festival, at the same date and, he undertakes, also, to solve her genealogy. She is said to have been of royal origin; her father being Fearguss, son of Fethlemid, son to King Laoighaire, son to Niall of the Nine Hostages. She was niece to St. Fortchern, who became one of St. Patrick's earliest converts, in Ireland. It is thought, that her earliest lessons of virtue and of culture were given, by her holy relative, while her name, Lassair, in Irish signifying "a flame," was happily typical of that Divine ardour, which warmed all her affections. Her parents desired for their daughter a suitable marriage, but, being resolved on a life of celibacy and retirement, she wished to leave their home. So eager was she, that her youth should belong to a heavenly spouse, a name, in Irish, Algasach, and Latinized Desideriosa, was added to her former appellation. In St, Brigid's Acts, there is mention made of a St. Lasrea, and Colgan seems to think, her commemoration fell on this day. Already have we alluded to her, in connexion with the renowned Abbess of Kildare. However, she seems to have been a person, altogether distinct from the present Lassara, who flourished a little after her time. Before and about the middle of the sixth century, St. Finnian, Abbot of Clonard, had a great school opened, in his monastery; and, the noble virgin was placed under his charge, to be instructed, in all science, religious and mundane. To St. Kieran, afterwards Abbot of Clonmacnoise, was especially committed the care of her education; for, St. Finnian had an inspiration, that she should become a very distinguished saint, and preside over a community of pious virgins. As an instance of the extreme circumspection and care, manifested for the young princess, while residing at Clonard; she lodged and boarded with a virtuous widow, who lived near the monastery. And, we are told, that neither did St. Kieran presume to gaze on her features, nor did his young pupil dare to look in his face, during the whole course of her instruction. She learned the Sacred Scriptures and the Psalms, through him. Another extraordinary occurrence is related, that an Angel brought St. Lassara from St. Finnian's patronage, and placed her in the convent of his sister, St. Rioghnach, or Regnata. Here, she seems to have remained for some time, until feeling desirous of returning to her own part of the country, St. Finnian was consulted as to her guide. He replied to Regnacia, that the same heavenly messenger, who brought her away, should also conduct her homewards. Accordingly the Angel, raising her in the air, like 'another Halbacuc, bore the virgin to her own country’. Here, greatly abounding in sanctity, this chaste spouse of Christ built a church, at a place, called Doire Mac Aidhmechain. At this place, she wrought many miracles, but the year of her demise is not found on record. The simple name, Lassar, is set down, in the Martyrology of Tallagh, at the 29th of March. The published Martyrology of Tallagh mentions, however, that veneration was given to Ailgasach, at this date. As we have already seen, this is only another designation, applied to her. Marianus O'Gorman, and Cathal Maguire commemorate her, in like manner, at the 29th of March. A saint, thus described, as Lassar, Virgin, is mentioned in the Martyrology of Donegal, and as having been venerated, on this day, in accord with the authorities of an earlier date, on the subject of Irish saint history. March 28 is the feastday of Saint Conall, linked to both County Meath and to the Aran islands where his memory is preserved with that of three other Irish saints - Fursa, Brendan of Birr and Berchan. Canon O'Hanlon has the details, although I am left wondering what lies behind the linking of these particular saints. In his footnotes, O'Hanlon admits that he cannot identify the saint Berchan and is unsure that Conall of Aran is our Saint Conall of Kilskyre. Brendan and Fursey are well-known saints who flourished much earlier than the ninth-century Conall, so I am left wondering how and why they came to be linked with him and the obscure Berchan on Aranmore. I suspect that there has been some confusion and will thus need to do some further research into the 'four beautiful saints'. The servant of Christ, Conall, or Conald, is said to have been son to Fiachna, Prince of East Meath, and of the blood royal of Ireland. The latter was son to Maelduin, son of Column, son to Aedh, son of Libren, son to Dallen, son of Endeus, son to Loegaire, son of Niall of the Nine Hostages. Colgan has entered some notices, in which an effort is made to investigate matters, serving to illustrate this saint's biography. The Bollandists barely notice him, with doubts of his claim to a legitimate cultus. We are told, that Conall was at first Bishop of Kilskyre, or Kilskeer. This old church is now a ruin, measuring eighty-two feet, by twenty-seven feet, three inches. The body is completely desolated, for the windows, doorway, and east wall, have disappeared. The western end terminated, in a triple belfry. Within the chancel, there is a sepulchral cross, which originally marked the grave of an ecclesiastic. Kilskyre was plundered and burned, on more than one occasion; and, after the English Invasion, a parish church merely remained. It is now a parish, in the barony of Upper Kells, and county of Meath. Conall was the only bishop we meet with in that place. Thence, it would seem, he went to the Great Island of Aran. Here, he is said to have taken up his residence, at a place now known as Teampul an cheathruir aluinn, Anglicised, "the church of the four beauties," or of "the four beautiful saints." Only a few fragments of the walls now remain. It is related, that there St. Furseus spent several years, in solitude and prayer, before he set out on the mission of founding his establishment at Perrone. His memory has not departed from the minds of the Araners; for, the people of those islands greatly venerate this extraordinary saint. They still relate many cures effected, through intercession of the same holy man. 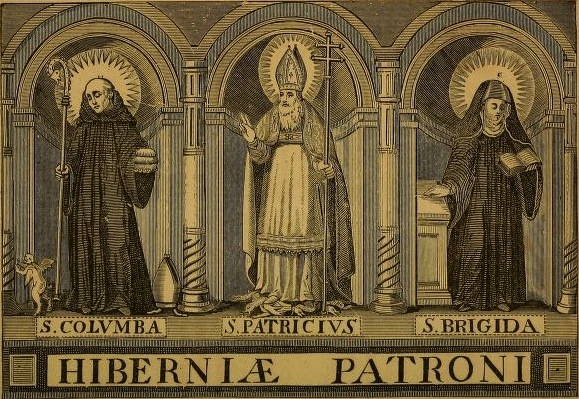 St. Brendan of Birr was another of those popular heroes, as also St. Berchan, with the present St. Conall, according to the author already quoted. During the reign of Aidus Finliath, who obtained such advantages over the Danes, St. Conall died, A.D. 865, or 866, and on the 28th day of March. The "Chronicon Scotorum," however, has his demise at A.D. 867. His record is found, in the Martyrology of Tallagh, at the 28th of March. Marianus O'Gorman and Maguire commemorate him, in like manner, and style him a bishop. On this day, in the Martyrology of Donegal, we find mentioned the name of Conall, Bishop, as having veneration paid him. St. Fursey, with Brendan of Birr, Berchan, and the present Conall, as we are told, were buried in the cemetery of the same church, and their bodies were deposited in the same tomb. It seems possible, that after our saint's time—the number being completed—that old church got its distinguishing appellation, of belonging to "the four beautiful saints," and this name it still bears. According to Colgan, the Translation, or some Festival, of this saint was kept, at Trim, on the 17th of February, when many holy persons are commemorated, on that day, and at the same place. He thinks, several of these were related to the present St. Conall; but, the matter is altogether doubtful, so far as he is concerned. A few brief notices of this sainted bishop are set down, by Colgan, at the 27th of March; while the Bollandists' more briefly record him, as Suarlechus, Episc. Fobariensis. Our Irish accounts style him, Suarlech, or otherwise, Suarlius, or Suairleth. He became a monk, in the Abbey of Fore, county of Westmeath. By some, he is said to have been a disciple of St. Fechin, the founder, who died, A.D. 664. This statement, however, seems hardly reconcilable with chronological dates. After living many years, in humble subjection and in practising a penitential life, he succeeded Dubdaboren, in the government of that monastery. The death of this abbot is thus entered, at the year 735: "Dubhdabhoireann, Abbot of Fobhar [Fore], died." — Dr. O'Donovan's" Annals of the Four Masters," vol.i., pp. 336, 337. To the office of Abbot Suairlech was advanced, about the year 735. Afterwards, he was assumed to the exercise of episcopal functions; he being, as is supposed, the first Bishop of Fore ; for, we do not read, that any of his predecessors, in the monastery, had previously enjoyed such a title. During the reign of Domnald Murchadh, King of Ireland, our saint was called to the enjoyment of eternal felicity, on the 27th of March. He died, on that day, in the year 745; and, during this very same year, Fore was burned. The Annals of Ulster place his death, at A.D. 749, but the entry in the Annals of the Four Masters reads: " The age of Christ, 745. The seventh year of Domhnall. St. Suairleach, Bishop of Fobhar [Fore], died on the 21st of March." —Dr. O'Donovan's "Annals of the Four Masters," vol. i., pp. 348, 349. He must have attained a very advanced age, were we to credit the statement, of his having been in early life, a disciple, under St. Fechin. His name is found, in the Martyrology of Tallagh, at the 27th of March, as Suairleach, Bishop. Marianus O'Gorman and Cathal Maguire, Ukewise, record him, as Bishop of Fore, at this day. Under the head of Fobhar, Duald Mac Firbis enters, Suairlech, bishop of Fobhar, rested, A.D. 745, March 27th. The Martyrology of Donegal has entered, likewise, on this day, Suairlech, Bishop of Fobhar. The parish of Killeigh is situated partly in the barony of Upper Philipstown, but chiefly in that of Geashill. It consists of the union of the former parishes or ecclesiastical districts of Killeigh, Ballykeane and Geashill. This district is noted in both the secular and still more in the ecclesiastical annals of Ireland. The name of Killeigh is common with another ecclesiastical establishment which, according to Colgan, was situated in East Breifny. The Killeigh with which we are at present concerned is situated in Ofalia, and is always distinguished from the other by the addition droma foda. Achadh-droma-foda signifies the field of the long ridge, and Cill was prefixed after St. Sinchell had erected his church there. The name, as Dr. O’Donovan adds (Note to Four Masters) is very descriptive of the locality, for a remarkable, long, low druim or ridge extends south-west-wards, immediately over the village of Killeigh. The entire of the ancient Ofalia, from Slieve Bloom to the Hill of Allen, and from the Sugar-loaf hill to the Great Heath is a plain nearly as level as the surface of a tranquil sea, and the droma-foda, though not high, becomes a remarkable feature in so level a district. AD. 548. St. Senchell the Elder, son of Ceanannan, Abbot of Cill-Achaidh-Droma-foda, died on the 26th day of March. Thirty and three hundred years was the length of his life. (Four Masters.) Colgan (AL SS., p. 747), thinks this number should be one hundred and thirty. In the Mart. Tal. we find at 26th March, “Sinchelli, Abb. Chilli Achaidh; and at 25th June, “Sinchell Cilli Achaidh.” The former refers to St. Senchell, Senior, the latter to St. Senchell, Junior. Was the Death of Seancheall. A notice appears, in the Martyrology of Tallagh, at this date, of " Columb inghen Buiti." The Bollandists only note down this entry. The festival of Columba, daughter of Baoit, also occurs, in the Martyrology of Donegal, on this day. SLIEVE DONARD, IN THE COUNTY OF DOWN. BY CANON H. W. LETT, M.A., M.R.I.A.
" I find, however, that the fact is otherwise. The tradition preserved in the country concerning St. Donart is briefly this. When St. Patrick and his holy family came to Iveagh, and to that level district at the foot of the mountain called Slieve Donart, he sent one of his servants to a neighbouring chieftain named Donnart, to request of him to contribute something towards the support of his clargy (sic). Donart, at this time a fierce and warlike pagan chief, desired the servant to go and drive home yon bull (pointing to him in a certain field) to his master Patrick; but this was out of derision, because the fierce warrior well knew that twenty persons would be unable to drive that bull to any place, in consequence of his fierce and untameable nature. 'Patrick's servant, sir, goes to the field, and far from being able to drive home the mad bull, he narrowly escaped being killed by that fierce animal.
" So he returns to Patrick, and tells him the whole transaction. Then Patrick said to his servant “ As Donnart has given you leave to drive home the bull, take this halter with you, and as soon as you go to the place where the bull is, he will put his head into it, and then walk home with you.' (The power of God, you know, sir, goes beyond anything. ) This was accordingly done, and, mirabile dictu, the animal having laid aside his native ferocity, walked over to the servant, put his head into the halter, and then walked home with him, meek and silent as the lamb when led to the slaughter. So great are the favours bestowed by the Almighty on those He loves! Patrick then got the bull killed and salted.
" Soon after this, as the fierce Donnart was one day walking out from his habitation, the fort of Rath Murbholg, near where the old Church of Maagherawe  stood, he missed his bull, and swore by the wind, the sun, and the moon, that he would banish Patrick and his clargy out of his territory; with that, sir, he assembles his chosen troops, and coming to where Patrick, his family, and adherents were, accuses the saint of having sent his servant to steal his bull. Patrick replied that his servant had first obtained his highness's permission, but Donnart denied that he had granted any. So taking the feet, flesh, and skin, and placing them together, as well as he could, he knelt down, sir, on his hare knees on the ground, and prayed to the Disposer of all things to restore the hull to his former life and ferocity; and, wonderful to he said, all the distorted joints of the animal were replaced in their respective sockets, and all the organs and instruments of motion and life in all the channels and conductors of the animal fluids and spirits of existence were restored to their original functions, and the hull started into life resuming all his original fierceness.
" At the sight Donnart was seized with dismay, and throwing himself at the feet of the saint begged that he would take him under his protection, and make him one of his people by baptizing him.
" From this moment the warlike Donnart became a meek and humble disciple, and having become acquainted with the mild spirit of the Gospel, and seen the strict morality and self-refusal recommended in the Book of Life, he was induced to resign his chieftainship, abandon his fortified residence, give up his savage amusements of hunting the elk and other wild animals of the plain, and to betake himself to fasting and praying on the highest apex of that wild and desolate range of mountains which formed the southern boundary of his kingdom.
" St. Donnart says Mass every Sunday on his altar on the North -Western cairn on the mountain. There is also a cave running from the sea-shore at the South of Newcastle to the summit (if report be true) of Slieve Donard, through which cave some men have been so foolhardy as to venture up to the summit of the mountain, but after they had gone to a certain distance they were met by St. Donnart in his robes, who admonished them of the foolhardiness of their adventure, and, Lord bless you, Donnart was right, for it is difficult to climb up the steep side of that wild mountain in the open air, and under the broad light of day, not to say in a dark, steep cave. He also told them that it was to be his own peculiar residence until the day of Judgment." 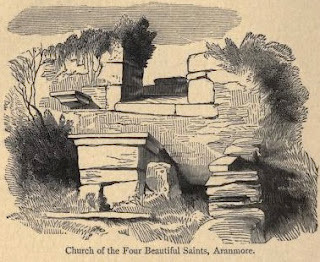 St. Donnart, or Domangard, or Donard, spent the life of a hermit on the mountain which bears his name, and built a cell or oratory on the top of it, somewhere near the end of the fifth century, having died, according to the Calendar, in the year 506, on the 24th of March; but the Patron Day used to be observed on St. James's Day, the 25th of July, when, according to Harris, "people in this neighbourhood climb up the mountain to do penance, and pay their devotions perhaps to both saints." This author states further, that: "On the Summit of this Mountain are two rude Edifices (if they may be so termed) one being a huge heap of Stones piled up in a piramidical Figure, in which are formed several Cavities, wherein the Devotees shelter themselves in bad Weather while they hear Mass; and in the center of this Heap is a Cave formed by broad, flat stones so disposed as to support each other without the help of Cement. The other Edifice is composed of many Stones so disposed in rude Walls and Partitions, called Chappels, and, perhaps, was the Oratory and Cell erected by St. Domangard." Sir William Petty marks on his map, on the north-east side of Slieve Donard, "Leniord's Chapel,"  which is probably a mistake for Donard's Chapel. Unfortunately none of these edifices now exist; they were knocked down by the staff of the Ordnance Survey early in the nineteenth century, to form the cairns that now surmount Slieve Donard, and to provide materials for the erection of their camp. The remains of the camp are visible a short distance south of the great cairn. The men engaged on the survey occupied quarters here for nearly nine months, and it was by them that the covered well now taken by visitors for St. Donard' s cell was formed in the great cairn to provide them with a supply of water. 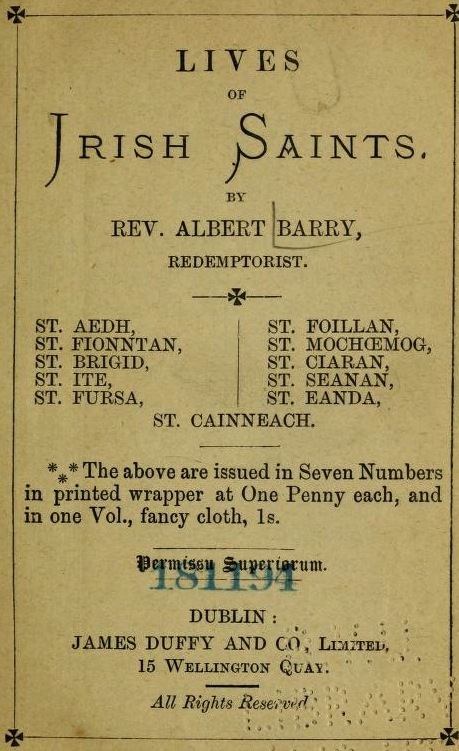 Harris alludes to the tradition in the neighbourhood celebrating the virtues and miracles, &c., of St. Donard, and adds to what is related above, that "by his application much money was collected for building the Cathedral of Down; which must then be understood to be one of the first churches erected there in the time of St. Patrick." In the same vol., p. 120, is the statement that " Slieve Donard . . . is known also by the latter name of Mount Malby, from a Captain so called, of no inconsiderable reputation in the wars of Queen Elizabeth, and whose name yet continues about Dundrum." The present writer has not met with the name in any book or map. This makes "Slieve Snaven" and "Slieve Neir" to be identical with Slieve Commedah, of which Shanslive is the northern shoulder, and Slievenamaddy and Slievenabrook are the lower slopes. It is Walter Harris, in his description, at p. 123 of his "Antient and Present State of the County of Down" (1744), and his Map of the said County, which has made it difficult to know what mountain he intended to designate by the name of "Slieve Snaven." I have shown above that Harris's description, at p. 81, must refer to another locality than that marked "Snaven" on his map. And now I come to the passage which has been slavishly copied, and without any acknowledgment, into Irish tourists' guide-books for many years, and which has constituted a puzzle to those who have tried to identify the localities. This passage in Harris begins: "A deep and narrow vale divides Slieve Donard from Slieve Snaven, or the Creeping Mountain, so called because it must be climbed in a creeping posture; and through this vale winds a pretty serpentine stream which discharges itself into the sea to the Eastward of the Mountains." I think that those who are familiar with the Mournes will not fail to recognise in this passage an accurate description of the valley over-hung by the Eagle Rocks of Slieve Donard, and through which flows the Glen River, or White River, that forms the cascades in Donard Lodge Demesne: Slieve Commedah, i.e. Harris' Slieve Snaven, being divided by it from Slieve Donard; while the rest of the passage in Harris refers to quite another place, viz. the Cove Mountain. Maghera, near Newcastle, where there is part of an old church and round tower. Or this may have been intended for the Church of St. Mary, a ruinous bit of which still remains in a churchyard near the Bloody Bridge. O'Donovan had met with this description in The Dublin Penny Journal of May 3rd, 1834.
 " Antient and Present State of the County of Down " (1744), p. 81. O'Donovan, in one of his letters from the County Down, mentions having examined a copy of this map in Scarvagh House, County Down. Journal of the Royal Society of Antiquaries of Ireland Vol. 35 (1905), 230-233. The early Irish calendars record one of their interesting but frustratingly obscure groups of saints at March 23, with notices of The Daughters of Feradhach. Canon O'Hanlon tells us that on the calendar of Saint Oengus only one daughter is noted, I wonder if this is reflected in all of the manuscript sources? He also tells us that one of the group may be Saint Kentigerna, this holy lady ended her days in Scotland as a hermitess, her son Saint Fillan is one of Scotland's well-known saints. The Daughter or Daughters of Feradhach. In the “Feilire” of St. Aengus, the daughter of Feradhach is commemorated on the 23rd of March; while the Martyrology of Tallagh registers Inghena Feradaigh, or “the daughters of Feradach.” One of these most probably was St. Kentigerna, whose Acts have already appeared, at the 7th of January. A festival, in honour of the Daughter of Feradhach, was celebrated on this day, as we read from the Martyrology of Donegal. The Filiae Feradachi are noticed, merely, at this date, by the Bollandists. St. Deghitche, or Deghitghi, Virgin. The Martyrology of Tallagh records a Saint Deghitghi, but without further designation at this day. We find mentioned, also in the Martyrology of Donegal, a saint named Deghitche, as having a festival celebrated, at the same date. The Bollandists – alluding furthermore to Marianus O’Gorman – have Saint Degithea, a Virgin, at the 22nd March. Colgan offers a passing conjecture, that the present holy woman may be identical, with a St. Geghia, of Inis Geghe, who is mentioned, in the Irish Life of St. Farannan. SAINT EANDA was born at Rathmore (near Clogher), in the year 458. His father was Conall Derg, the King of Oirghial in Uladh, and his mother was Brig-Aebhfinn, granddaughter of the King of Ard (Co. Down). He had four sisters. Eanda was chosen King of Oirghial after the death of his father, and he led a good and stainless life amidst his wild and warlike clansmen. He grew up a lily amongst thorns. When a neighbouring chieftain soon afterwards did some harm to his tribe, he was forced against his will to inaugurate his reign by making war upon him. He and his half Christian followers went forth on the war-path, and having slain a man belonging to the hostile tribe, came homewards in triumph, brandishing their spears, striking their shields, and singing with savage cries their wild war songs. They drew nigh on their way to a monastery of Nuns, where Fanchea, the sister of Eanda, was Abbess. Fanchea, who had given her heart to resort early to the Lord, hearing the savage shouts of the soldiers, said to the Nuns: “This unseemly shouting is not pleasing to Jesus Christ.” But when she heard the voice of Eanda, she said: “He is a child of the heavenly kingdom.” Fanchea and another Nun stood at the gate of the monastery, and when Eanda hastened towards her, she lifted her hand towards him and said loudly: “Do not come near to us, for you are stained with blood.” Eanda was abashed, and humbly answered: “I am guiltless of bloodshed as well as of all other crimes." But she said to him: " Why, wretched man, do you thus provoke God to anger? Why do you drown your soul in a sea of evils by your many sins?" Eanda answered boldly: "I have the inheritance of my father, and I must fight against my foes." Fanchea said to him : " Your father is lost, and suffers for his crimes.” Eanda was silent, but after a while said to his sister : "Give me as my wife the maiden whom you are bringing up in the monastery, and I will then give heed to your advice.” Fanchea thereupon promised him to lay all before the maiden. She went inside, and taking the girl aside into a room, said to her: "You must now make a choice between loving and serving Him whom I love and serve, and loving and serving an earthly husband.” The maiden, filled with grace and light from God, at once answered: “I prefer to love and serve Him whom you love." Fanchea then bade her to stretch herself upon the bed that was in the room. The maiden lay down, and soon, by a miracle, her fair soul left her body and went to her heavenly Spouse, and her cold and lifeless body lay upon the bed. Fanchea threw a covering over the white face of the dead girl, and then going forth beckoned Eanda to follow her into the room. Fanchea then uncovering the lifeless face of the dead girl, said to her awe-struck brother: “Behold her whom you sought to be your wife." Eanda was speechless, but at length, almost choking with grief, said slowly in a whisper: "Her face, indeed, is white and unsightly." Fanchea then spoke strongly to him of the happiness of heaven and the torments of hell. He wept as she spoke, and his heart was changed. He at once made up his mind to forsake the pleasures and honours of earth, and to become a Monk. He went home, and shortly afterwards gave up his kingdom in spite of the earnest entreaties of his people who loved and honoured him. Eanda built for himself a wooden hut not far from the monastery of Fanchea, and learned to lead a holy life by the help and example of his holy sister. He spent his days in prayer and work. He built up a high embankment around the monastery, and employed his time in rooting up the weeds and briars that grew in the garden of the Nuns. A chieftain made a sudden onslaught about this time on the people of Oirghial, and the two clans fought a battle in the neighbourhood of the monastery. Eanda, hearing the wild shouts of the warriors, which made the woodland ring, snatched up a stake from a pile of wood which he had heaped together for a building, and rushed to help his fellow-clansmen, but Fanchea saw him and cried out: "Put your hand on your head." He put up his hand, and feeling his monastic tonsure, remembered that he had become a soldier of Jesus Christ, and throwing his weapon upon the earth, he slowly went back to his work. Fanchea soon afterwards persuaded him to leave his native land, and to become a pilgrim for the sake of Christ. Eanda set forth at the bidding of his holy sister, and having sailed to Britain, became a Monk in the monastery of Saint Paulinus at Ty-gwyn (Whitehouse), in Glyn-rosin (Caermarthenshire),in the year 481. Saint Dewi and Saint Teilo, afterwards Bishop of Llandaff, were then living in the monastery. The Monks of Ty-gwyn were highly esteemed by the people, who were wont to say of them: "These holy men by the power of God make wild beasts obedient to their will. We can slay them when hunting, but we are not able to tame them. When these apostles preach to us we do not hearken to them, but the beasts of the field listen to and obey them." Eanda spent five years working, praying, and doing the will of Paulinas, on the banks of the Taf, in the small and lovely vale of Rosnant. He soon became perfect in the Gospel counsels, and with the blessing of Paulinus he went back to Ireland. Eanda stayed for a short time in Uladh, and then went to Caiseal (Cashel), where King Aenghus Nadfraech, the husband of his sister Dairinne, held his court. Aenghus besought him to build a monastery at the foot of his rock-hewn stronghold, but Eanda was unwilling to dwell there, and begged the King to bestow upon him the lonely island of Ara-mohr. Aenghus thereupon made a gift of Ara-mohr to God and to Eanda in the year 486, and Eanda and his fellow Monks at once hastened to take possession of their island home. Eanda at length stood on the sea shore and beheld the fair island sparkling like an emerald far out on the blue waves of Lough Lurgan, whilst its steep cliffs glowed brightly in the sunshine. He glorified God with the sacrifice of praise, and he and his disciples sang together: " My soul doth magnify the Lord.” They sailed across the nine miles of water that lay between them and the island, and took possession of it in the name of God. They then built wooden huts to shelter themselves from the stormy winds, and a small House of prayer, wherein to sing the praises of God and celebrate the divine mysteries. Ara-mohr was at that time a lovely island with wooded valleys, green fields, and fair sheltered nooks bright with wild flowers, and the peaceful island was surrounded by the blue water of the sea, which sometimes made music in the dark caves, but more often dashed with the sound of thunder against its lofty cliffs. These cliffs rose out of the water to the height of 300 feet on the western side of the island, and from thence the land fell in gentle slopes towards the eastern sea-shore. Eanda built his monastery and church near the sea or the north-east corner of the island, where the land was most fertile, and he there led a life of great holiness. “Eanda of great piety," writes Cuinnen of Conneire, "loved in Ara victorious virtue, and a narrow prison of hard stone to bring all unto heaven.” His holiness became known far and wide, and he soon had around him a family of 150 Monks. He divided them into ten companies, and built a church for each band of Monks. They fasted and prayed, and sang the praises of God night and day. They lived mostly on shell-fish and herbs. Waiting my coming through the tardy night. The sacred knowledge that his bosom held." Saint Ciaran also came to behold and to get wisdom from Eanda at Ara-mohr. Saint Ciaran one night dreamed that he was standing on the bank of the river Sionan, and that he saw a great tree clothed with leaves and fruits, and its outstretched branches cast their shade over the whole of Ireland. He made known his dream to Eanda, and Eanda said: "You are that great and fruitful tree. You shall bring forth sweet fruits of good works, and you shall be held in honour throughout the whole island." He then bade Ciaran go forth in the name of the Lord and build a church and monastery. They went together to the sea-shore, having bound each other to an everlasting friendship. St. Ciaran bade farewell to Eanda, and sailed away in his hide-covered wicker-work skiff, which skimmed along the waves like a snow-white sea bird Eanda having put up a cross as a sign of their promise of friendship, went back full of sadness to the monastery. He wept and fasted and prayed for three days- An Angel came and said to him: "Why are you so sad and why do you afflict your flesh so much?" Eanda answered: ”I am sad at heart because I saw all the Angels of Ara go away with Ciaran”. The Angel said: "God sent His Angels with Ciaran because he is very dear to Him; but be no longer sorrowful, for they shall come back. Cease in the name of the Lord to fast." But Eanda answered: “I will not cease to fast until I get three gifts from God. I ask that the gate of hell shall never be shut upon any one who has been sorry for his sins, and has been buried beside me; I also ask that whosoever calls upon me may be helped by my Lord Jesus Christ; and I ask that I myself may be placed at the right hand of God with His saints”. The Angel said: “God has granted to you what you have asked." A multitude of holy men, whose names are known to God alone, lived with Eanda at Ara-mohr ; and the island became illustrious and a land of saints. These holy men had inward peace of mind, and wore a smile upon their face as if they were listening to the songs of Angels. They were like their fair island home, around whose rocky shore the restless sea-waves dashed in fury. When they wandered clad in white with sandalled feet along the pebbly beach, or stood on the bold headlands and beheld the outspread sea, they thought of God, whose throne is heaven, and whose footstool is the earth, who holds up the whole world with His fingers and holds the sea in the hollow of His hand, and when they heard the ceaseless war of the waves in the deep chasms and the shrill screams of the wild sea birds as they flew over the water, they thought of the evil passions of their fellow-men. Eanda prayed to God that the island of Ara-mohr might become the home of His saints, and God heard his earnest prayer, and made known to him that many saints should arise on the last day from the graveyards of Ara. Ara of the flowers became Ara of the Saints. Eanda lived to a “decrepit old age,” and died in the year 542. Aenghus Ceile-De, in his Litany of Irish Saints, gives the feast of “Eanda the illustrious of Ara" at March 21st. Ara-mohr is now a bleak wilderness of limestone rock, crowned by the windworn walls of the ruined fortress of Dun-Aenghus. The ruined Temples and the gravestones of the 120 "virgin Saints” of Ara alone remain to tell the story of that holy island, and Teglach-Eanda, near which the body of Eanda awaits the resurrection, lay buried for many years beneath the advancing tide of drift sand which has made a desert of his once fertile home. Oh, Ara, my sun, my love is in the west with thee." St. Cathcan, Bishop of Rath-derthaighe. A record appears in the Martyrology of Tallagh, at this date, regarding a St. Catchan. There, his locality is designated, Ratha Turthaighe. The Bollandists record him, likewise, as Cathchan, of Rath-dertaighe. Under the head of Rath-Darthaighe, (or Derthaighe), Duald Mac Firbis enters a Cathchan —or perhaps Cathchu—bishop, at March 20th. Likewise, on this day, we find entered in the Martyrology of Donegal, as having veneration paid him, a St. Cathcan, Bishop, of Rath-derthaighe. ST. LACTEAN, OR LACTINUS, ABBOT OF FRESHFORD, COUNTY OF KILKENNY. Near some of our large modern towns and cities, the thought of death seems to be concealed, even in their cemeteries, under the garniture of shrubs and flowers, or under those refined sentiments, produced by the sculptor's chisel, and over partial epitaph. Not so, however, do holy persons seek to disguise from themselves, realities of life and death, in a religious course. This saint, called also Lactenus, Lactinius, and Lactanus, is commemorated in Colgan's work, and in the Bollandists' great collection. He was a member of Corpre Musc's illustrious family, belonging to Muskerry, in the county of Cork. An imperfect Life, in which our saint is constantly called Laccinus, was obtained by the Bollandists, from a Dublin Manuscript, and that memoir appears to have been originally of some length, since only the early period of his career is preserved, and written with some degree of prolixity. It states, that while St. Molua lived under the discipline of St. Comgall, at Bangor, an angel appeared to him, and predicted the birth of Lactinus—after an interval of fifteen years—who was to be his future friend and companion. Afterwards, it was related, that Molua never smiled, until he heard of the infant's birth. He was lineally descended, from Connor the Second, King of Ireland. The father of our saint is called Torphurus and Torben, by some, according to a mode of speaking, not uncommon among our ancient writers; however, Colgan supposes, that this had been the name of an ancestor of Lactinus, omitted in the genealogy. Elsewhere, this pedigree deduces his origin, from Connor, Monarch of Ireland. According to other accounts, he is called son to Corpre, son of Nuachar, son to Carthinn, son of Cannach, son to Corpre Musc, son of King Connor, who was the son of Moglam. Our saint was born some time in the sixth century, and his mother is called Senecha. The Rev. S. Baring-Gould has some account of this saint. Before the birth of the infant, and while he was borne in his mother's womb, a miracle is recorded, as foreshadowing his great sanctity; for a blind old man, called Mohemeth, received light, which gave him a miraculous vision of Rome, and of distant places, on land and on sea. Thus might the child be compared to Jacob, Jeremias and St. John the Baptist, sanctified in advance of their nativities. At the time of his birth, no river, spring, or water, was to be found near; but, the venerable Mohemeth, taking the child's hand, made with it a sign of the cross on the dry earth, and immediately a living fountain sprung up from the soil. Then Mohemeth, giving thanks to God, baptized the infant in the water, delivered him to his parent, and then departed with great joy, towards his own part of the country. Either forgetting or ignorant of the fact, that the infant had been duly baptized, some of his friends brought him to Blessed Elpheus for baptism. But, the latter had a revelation, that this Sacrament had been already received, and he properly refused to reiterate it; while filled with a prophetic spirit, he predicted the future sanctity and merits of the child, who was brought back to his parents. During infancy, Lactinus was miraculously preserved from suffering, although he had taken very unwholesome food; he also healed his mother from a dangerous tumour; nor were his miracles confined to human beings, for he was instrumental in removing a cattle plague, which prevailed in his neighbourhood. In the fifteenth year of St. Lactinus' age, his Angel Guardian, called Uriel, gave an admonition, that he should proceed to Bangor, where the great abbot, St. Comgall, had just commenced his religious foundation. The fame of this holy man, as an instructor, had spread to distant parts of Ireland, and St. Latinus was brought by Uriel, who moulded his pious dispositions, to become a disciple. St. Comgall received him, and appointed St. Molua to become his teacher. Under such a guide, the scholar was indefatigable in study, and he became a thorough proficient in a knowledge of the Sacred Scriptures, when he had spent diligently the time, until he attained the thirtieth year of his age. An old Life of St. Molua indicates, that according to a prediction of St. Dagan, the latter prophesied, St. Lactinus was destined to succeed the former, in his well-known seat, at Clonfert Molua. Lactean thus received his early education, at the School of Bangor, founded by the illustrious St. Comgall - and under the rule of this abbot, he made great proficiency, in virtue and learning. Especially, in a knowledge of Holy Scriptures was he distinguished; so that, at length, it pleased St. Comgall to send him forth with other disciples, to found religious houses, in different parts of Ireland. Among other houses, which he established, our saint founded one, at a place, called Achadh-ur, which lay on the confines of Ossory, and it is supposed to have been identical, with the present Freshford, in Kilkenny County. At this place, a prebend, called Aghour, is yet known; and this has probably become a corruption of Achadh-ur, Fresh Field, or Green field, as rendered in St. Mochoemoc's ancient Life. It was so designated, on account of the number of rivulets, which intersected this part of the country. Some curious remains of an old church are to be seen, at this place. A very beautiful and an ancient Irish Romanesque's doorway is especially remarkable, for its elaborate mouldings in stone. An Irish inscription on it reveals the name of the founder of this church, but not the period when he flourished. 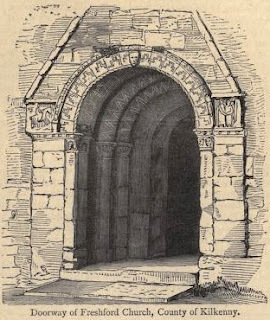 A projecting porch surrounds the doorway, and the west gable has pilasters at the angles. Near the ruins is Tobar Lachtin, or "Lachtain's Well," once regarded as sacred to the saint's memory, but now deserted. In the old Life of St. Mochoemoc, we are told, that whilst he lived at Rathen, compassionating the distressed state of his community, our saint brought with him to this place a present, consisting of thirty cows, one bull, two herdsmen and some utensils. Leaving these a short distance from the monastery, which he entered alone; he there asked for some milk to assuage a pretended necessity. The servant told St. Mochoemoc, that St. Lactinus who was infirm, requested some milk. The Abbot Mochoemoc ordered a measure to be brought, which being filled with water, on blessing it, this water immediately became changed into new milk. Having had a manifestation, regarding what had taken place, St. Lactinus received the measure, which again blessing, he converted its contents into the original element, saying to the servant who brought it, "I asked for milk, and not for water." Our saint was hospitably received by the Abbot Mochudda; but he only partook of food, when this latter holy person consented to receive the present, which he brought. When the cattle were driven to the monastery, St. Mochoemoc said, "I did not wish to receive cattle from any person whilst in this place, however through reverence and honour for you, I will receive your gift." St. Lactinus replied, "From this day, there shall always be an abundance of temporal possessions with thy brethren, and a number of religious men in thy city; whence, thou shalt pass away to Christ, but whence thou shalt also be expelled." On departure, these holy men embraced each other, with most tender demonstrations of friendship. Colgan tells us, that Cumineus of Connor, in his work on the special prerogatives and virtues of some amongst the principal Irish saints, indicates St. Lactinus to have been a strenuous defender of the Munster people, during some contests that took place between them and certain princes of Ireland. The same Cumineus says, our saint was a man, who practised frequent vigils, and who mortified his flesh, in a very remarkable degree. Our saint is related, to have wrought many miracles, and even to have raised the dead to life. Besides, its being said, that he ruled over or erected many monasteries, he is likewise called bishop, in different Martyrologies. Thus, the Carthusian Martyrology, that of Ferrarius, of Canisius, and of Joannes Kerkested, have distinguished him, by such a dignity; but, whether he held it, at Freshford, or in some other place, is not easily ascertainable. If he were a bishop, Dr. Lanigan believes, that Achadh-ur must have been his See; for, he is always called Lactinus of Achadh-ur. Besides, the monastery of Achadh-ur, another church denominated Belach-abrat, or Belach-Febhrat, seems to have been connected, in some measure, with our saint, as Colgan remarks. The ruins of Lislaughtin priory are to be seen in northern Kerry, This was founded for Franciscans, or Brothers Minor of the Strict Observance, in 1464, by O'Connor Kerry, according to some writers, or in 1478, as others have stated. The steeple, choir and other parts of this priory stood, in the last century. The parish church, at this place, is said to have been dedicated to an Irish saint, named Laghtin, who died in 622. He must therefore be identical with St. Lactean of Achad Ur, according to Colgan. But, it is urged, that he incorrectly confounded our saint, with the Abbot Lactean, who was a neighbour to St. Senan of Iniscathy, and with a Lacten, who succeeded St. Molua, at Clonfert Molua. St. Lactinus departed this life, on the 19th day of March, and in the year 622 according to our Irish Annalists, and Martyrologists. Thus, St. Aengus the Culdee, the Martyrology of Tallagh, the Calendar of Cashel, the Martyrologies of Marianus O'Gorman and of Maguire, as also that of the O'Clerys refer his feast to this date; while, the Martyrologies of the Carthusians, of Canisius, of Ferrarius, of Florarius, of Father Henry Fitzsimon, and of Herman Greuen, accord. A notice of this saint is in Bishop Forbes' work. Not only during his life, but even after the death of St. Lactean, miracles were wrought through his intercession. Especially, at a place, called Liosnascaith—now identical with Lisnaskea—in the diocese of Cashel, this was noticeable. Here, many infirm persons were cured from various diseases, at a well, which had been consecrated to his memory. Colgan tells us, he had accounts of these miracles, and of other supernatural incidents, from the lips of persons, who had experienced the efficacy of our saint's intercession. As the special patron of this place, St. Lactinus was often invoked on behalf of paralytics, and of possessed persons, while his merits were found effectual, against incantations and diabolical agency.